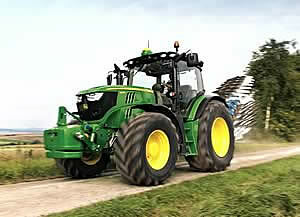 New small and medium frame tractors from the John Deere 6R Series tractor range can be seen on the John Deere stand at Cereals 2012 in June. With the addition of these new smaller models, nine tractors altogether are available for 2012, from 105 to 210hp (or 125 to 240hp with Intelligent Power Management, for road and pto applications). Featuring the new John Deere tractor family styling, all 6R models offer new levels of power, performance and operator comfort, including improved suspension and cab visibility, more powerful hydraulics and increased lift capacities. The small frame 6105R, 6115R and 6125R models are equipped with a Stage IIIB 4.5-litre four-cylinder PowerTech PVX engine rated from 105 to 130hp. John Deere’s fuel efficient diesel-only PowerTech engines use field proven technology to meet the latest emission standards, based on exhaust gas recirculation. The medium frame 6130R model is powered by a 130hp four-cylinder engine mounted on a six-cylinder frame, while the other two medium frame models, the 6140R and 6150R, are equipped with a Stage IIIB 6.8-litre six-cylinder PowerTech PVX engine rated at 140 and 150hp respectively. Employing John Deere’s established full-frame design, these new tractors also have a longer wheelbase to provide improved stability for loader applications. 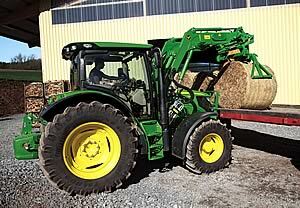 In addition, a higher permissible weight and payload allow bigger and heavier implements to be carried. An integrated front hitch with a lift capacity of 4000kg and a new front pto are also available ex-factory for the first time on 6R Series tractors. The front hitch is fully compatible with the new John Deere H-Series front loaders, which have been designed to provide maximum visibility and to match the new tyre sizes and tractor chassis dimensions. Transmission options include the newly designed 24-speed DirectDrive, which combines the handling comfort of an infinitely variable shift transmission (IVT) with the power efficiency of a mechanical unit, while providing fuel savings of up to 10g/kWh compared to an IVT. The new 6R ComfortView cab has over 20 per cent more space and a similar increase in visibility. It offers a completely new level of operator comfort, with features such as the 7in full-colour GreenStar 3 CommandCenter display with optional touch screen and video capability, integrated climate and radio controls, Bluetooth connectivity with SIM card access and an optional panorama roof. The display is fully compatible with ISOBUS and tractor-implement automation (TIA) applications. Further options include the new HCS Plus hydraulic cab suspension and TLS Plus triple link suspension for the front axle, to provide optimum traction and operator comfort. A new versatile lighting system also delivers 185 per cent more light output compared to previous models.